All custom decals are designed by our in-house artists. Customers will be given the opportunity to approve their custom decal before it is shipped. No worries! 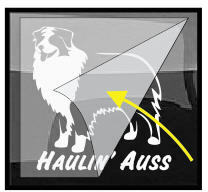 Vinyl Decal ~ add text or leave blank, choose size and color. NickerStickers Decals are Easy to Apply! Whether you've never, ever applied a decal before or are an old pro, NickerStickers go on smooth and easy and stick very well. Before you start, WASH THE SURFACE! We recommend you use plain old soap and water, 1/3 cup soap to 1 cup water. If there is any wax build up, use a scrubby. Finish with a lint free cloth to dry. You can add additional touch of extra cleaning with rubbing alcohol, mixed half and half with water. But soap and water is usually good enough. Step 1. Peel the transfer tape with the decal stuck to it away from the waxy backing paper. The adhesive side of your decal is now exposed. Be careful! Don't get it dirty and don't touch it with your fingers. Use the clear transfer tape to hold because you'll be taking that off later anyway. Step 2. Using the transfer tape, roll your decal on to the surface to which you are applying, starting at one corner and laying it down. 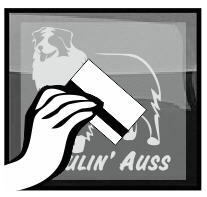 Once it is on the surface, rub on top of the clear transfer tape and decal using a credit card and working from the center out. Press lightly at first, then repeat more firmly. Repeat several times. Step 3. REMOVE THE TRANSFER TAPE. The decal is under the transfer tape. Pull the transfer tape up at a sharp angle beginning at one corner. Remove the clear tape on top of the decal and throw it away. 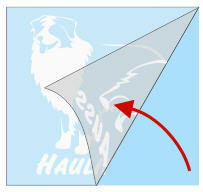 Your decal should easily stick to the surface while you are pulling up the transfer tape. If it's not sticking solid, try leaving it on overnight and taking it off the next day. Customizing your decal - How does it work? Each custom decal is designed by on of our in-house artists. We don't use automated systems to generate the custom design, so you won't see your custom design change automatically. Our staff artists work every day to create custom designs for our clients. Step 1. Find the species and/or breed you want and then locate the product that has the word "Custom" in the title. Step 2. Next, choose the options to customize the size, color, direction and text. You can leave the text blank if you wish to have just the animal with no text added. You can choose to pre-approve your design, or skip the pre-approval by choosing "I Trust You". If you have ordered a design previously from us, you can choose to have us look in our archives for a "Copy of Previous Design". Step. 3 Your decal will be designed by our artists when they see the options you have chosen on your order. 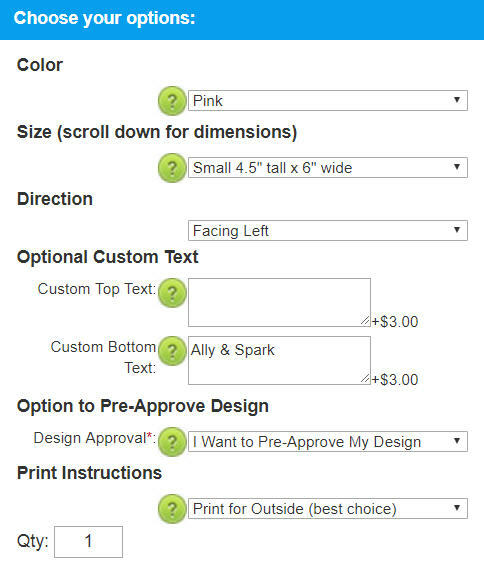 If you chose to pre-approve your design, a picture of the design will be emailed to you. Be sure to allow our email in your email server so that your pre-approval email does not go to spam! 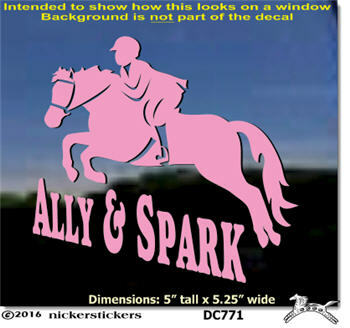 Your custom decal pre-approval request photo will include a picture of the design exactly how it will look when applied, including the size and color. Can I Request Changes to My Custom Decal? Yes! You can request changes to your design, such as a different font, and our artists will change the design and send another pre-approval email. If you choose to request pre-approval, but do not reply to approve your design after 10 days have passed, we will ship your decal without pre-approval. Custom decals are not refundable, so be sure it is exactly as you wish and be sure our email is on your email server's approved email list. This die-cut decal is made of high quality vinyl rated for six years. It is an all-weather adhesive decal that will stay put through all weather, sun and washing. If you add text, you have the option to pre-approve your custom decal. At your request, we will send an email with a picture of how your custom decal will look. We usually send your picture within 24 hours, but it may take up to 48 hours if we are processing many orders. You may request changes if needed. If you do not reply to our request to approve your decal design within 10 days, your custom decal will be shipped without approval. All custom decal sales are final and are not eligible for returns or refunds. If you want just the dog without any text, simply leave the text option blank. 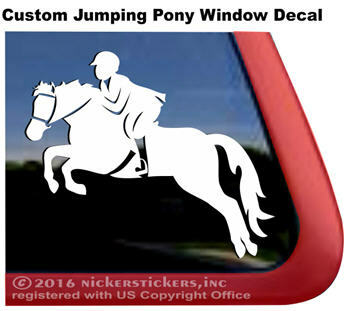 Your decal is designed to be used on the outside of your window or other surface, but you can choose to have it printed in reverse for the inside of the window. The decal can be removed, but will not be reusable after removal. Click Here for decal application instructions. This is the second decal I have ordered from your company, and I love both of them!!! You have excellent customer service and product! Thank you!! !